Should California Get a Bail Out? As some readers might recall, without budget solutions from the Governor and Legislature, the California State Controller was forced to issue IOUs to several State payees last July in order to prevent a $2.8 billion cash shortage. IOUs began printing July 2, and ended September 3 of last year. The California State Treasurer began redeeming the IOUs September 4, 2009, and sent out more than 89,000 letters to remind holders of IOUs of the redemption. Each IOU accrued interest through September 3, 2009, but holders do not earn interest past that date. The letter includes redemption instructions and contact information for any IOU holders who have questions about the redemption process. It is difficult to imagine why anyone holding these IOUs would delay their redemption, given the state’s worsening financial condition. To usher in the New Year, California declared a state of fiscal emergency after facing shortfalls of $6.6 billion for the year. This adds to the previous declarations made in 2009. But that’s by no means the full extent of the state’s deficit. Over the next 16 months, California faces a $20 billion deficit. I expect it to get much worse without radical cuts to the budget. As you might realize, California has been struggling to close its budget gap for well over a year, using job furloughs, cutting healthcare to families in need and many other methods implemented to save the state money. But the furloughs were overturned in court battles. Now state government employees have been told they will face a 5% wage cut across the board. And they will have to pay for more of their retirement plan. 5 percent reduction in the cost of the state workforce payroll implemented by executive order S-01-10 which requires all department directors to reduce their payrolls by 5 percent before July 2010. Note: Approval for pension contribution change and pay reduction will require collective bargaining and statute changes. The Governor was clear in his State of the State address that federal funds must be a part of the budget solution because the federal government is part of California’s budget problem. The Governor is committed to building a fair and equitable financial relationship with the federal government. California must be reimbursed for unfunded and under-funded federal mandates and relieved of the overly restrictive maintenance-of-effort requirements placed on our programs that prohibit us from living within our means. Our state must be freed from unfunded mandates to thrive and continue serving the people who need help the most. The Governor intends on the federal government paying California’s taxpayers the funds they are owed. Because he has a responsibility to Californians to ensure their budget is balanced under any circumstance, his budget identifies spending reductions and extension of revenue increases (listed below) that will go into effect in the event that the federal government fails to provide the $6.9 billion of additional funding proposed in the budget. If these measures are passed, you can imagine what it’s going to do to millions of residents of California who are already struggling to combat the most severe recession since the Great Depression. This economic collapse was trigger by the biggest wave of securities and real estate fraud in world history. To this day, the main perpetrators have not been indicted. And the media has aided these criminals by failing to address blame where it belongs. Despite making numerous cuts to state programs, (some vital) the state of California has asked Washington for assistance beyond the Recovery Act. Basically, California wants a bailout. While that might sound ludicrous, as I am about to show, California can make a very good case that taxpayers actually owe them money. As the accompanying table shows, California (and a few other states) are actually net donors to Washington, and have been for several years. For every dollar of tax revenues sent to Washington, California only receives $0.78 in return. That means that California is subsidizing federal spending more than most states. In fact, California is actually funding programs in other states. Therefore, shouldn’t California receive greater assistance than other states? Furthermore, wouldn’t it make sense to assist the state that serves as the largest component of the nation’s economic engine? As I have said on many occasions (mainly to clients and during interviews), California will be the first state to recover—specifically, the high-tech region of Northern California—no matter to what extent a recovery is defined. And it will recover with or without further assistance from Washington. The problem is that the recovery in Silicon Valley is not likely to lead to many new jobs. Many of these new jobs will be sent overseas. 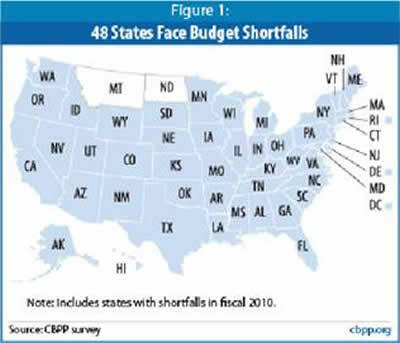 As you can see from the charts below, almost every state is facing huge budget deficits into at least 2012. In fact, for FY 2010, 48 states face deficits totaling $190 billion, or 28% of state budgets, representing the largest budget deficits ever. 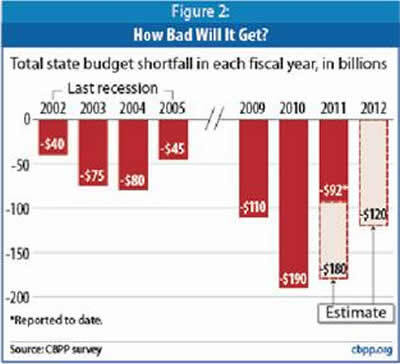 When FY 2011 is added, states are likely to face budget deficits of $350 billion. Despite the $87 billion from the ARRA, states have cut many vital services to respond to this historic crisis. But it simply has not been enough. 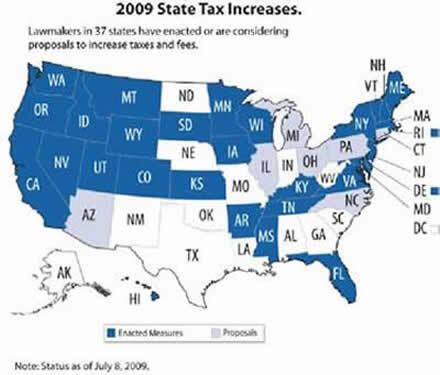 Most states have also increased taxes, while others have tax hike proposals on the table. 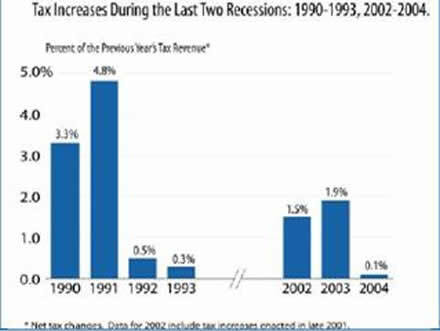 As the following chart illustrates, if history is any predictor of the future, states will continue to raise taxes much higher than previous levels. It is highly likely that several new taxes will be created. Some of these new taxes will be created by Washington but will be largely dispersed to states. I first made this prediction in the 2006 publication of America’s Financial Apocalypse. As you can see from the first table above, only 16 other states can claim they are owed money; some not much at all. In all fairness, these are the only states that have a valid basis for special assistance from Washington. As it turns out, since 2008, California has been receiving more than its fair share of tax contributions at $55 billion from the federal stimulus in 2008, and another $37 billion in 2009. When these funds are combined with the normal flow of federal funds, California received $1.02 for every $1 sent to Washington in 2008, and $1.45 per $1.00 in 2009. But what about the previous years when California sent more money to Washington than it received? 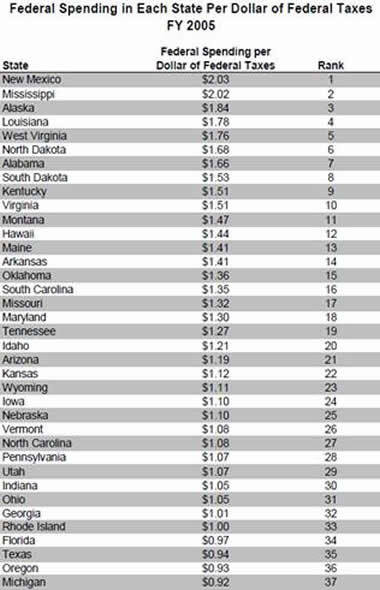 Finally, all states have received more than $1 for every $1 sent to Washington since 2008 due to the various stimulus packages. Don’t get me wrong. I am against all bailouts. I feel that once a bailout occurs, the government (taxpayers) should take full ownership of the entity. But the fact is that virtually every state has already received a bailout. The poorly run auto industry has received bailouts. The criminal financial industry has received bailouts. If any bailouts are to be made, they need to go to states that have received less back than they have continued, especially states that are vital to the economy. At the very least, California should receive some of the money it has contributed to Washington throughout the years, if not for fairness for the purpose of securing the economic engine of the U.S.
Perhaps California’s bailout should be paid for by a tax on the financial industry. After all, they caused this mess. Those who read America's Financial Apocalypse (2006) and Cashing in on the Real Estate Bubble (2007) were not only alerted to the catastrophe we see today, but were provided with SPECIFIC ways to profit that have yielded over 100% gains since then. Click here and here for some examples. If you want a chance to make $100,000, check this offer. Copyright © 2009. All Rights Reserved. Mike Stathis. Restrictions Against Reproduction: No part of this publication may be reproduced, stored in a retrieval system, or transmitted in any form or by any means, electronic, mechanical, photocopying, recording, scanning, or otherwise, except as permitted under Section 107 or 108 of the 1976 United States Copyright Act, without the prior written permission of the copyright owner and the Publisher. These articles and commentaries cannot be reposted or used in any publications for which there is any revenue generated directly or indirectly. These articles cannot be used to enhance the viewer appeal of any website, including any ad revenue on the website, other than those sites for which specific written permission has been granted. Any such violations are unlawful and violators will be prosecuted in accordance with these laws. 06 Nov 10, 10:49 Bail Out California? Why should we bail out California? The current mess is in part a fault of the Federal Government, but what will a bailout actually do? Will California manage its money any better than it already has? I can't see how it will do so; despite the woes that California has, they made no attempt to elect someone who could possibly dealwith the crisis. Instead they re-elect one of the most liberal governors in California's history. California elected him; they get what they deserve. No bailout for California; why should we reward their fiscal incompetence?